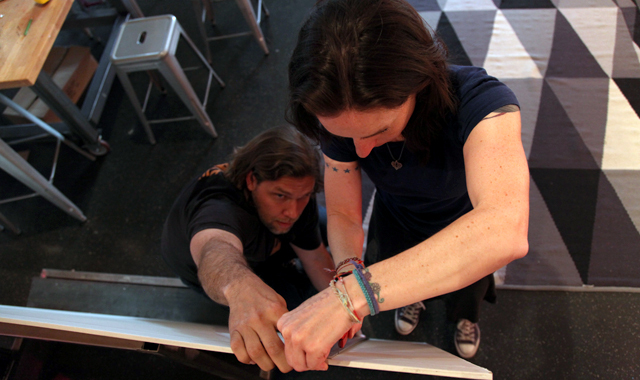 Shawn Rossiter and Liberty Blake working on a collaborative art project at The Leonardo. Dancers do it. Musicians do it. Even writers do it (we’re thinking of Wu Ming). So why not artists? This month, Artists of Utah is celebrating the art of collaboration with a special event at The Leonardo during the Utah Arts Festival that explores what happens when artists bring their individual skills, talents and temperaments together to create new artforms. CollaborART features works created in one collaborative form or another by Utah artists including: Liberty Blake, Chad Crane, Zane Lancaster, Vince Johnson, Shawn Rossiter and the late Francis Zimbeaux. The idea grew out of a collaborative project executed earlier this spring when Rossiter, who was then a resident artist at The Leonardo’s Art Lab, created a large-scale drawing with David Habben while the Gallery Stroll audience watched.|1| The event was so successful Art Lab director Jann Haworth asked the pair to return and do another one during the Utah Arts Festival (The Leonardo will be fenced into the festival, and access to The Leonardo will be included with festival admission). But it’s never fun to simply repeat what one has already done, so Rossiter had Artists of Utah organize a larger event, with multiple artists coming together to create collaborative work. Rossiter and Habben will be returning, but they will be joined by other artists. Chad Crane and Zane Lancaster, for instance, will be in The Lab during the festival to create new collaborative pieces. In 2011, the pair exhibited a series of works at Kayo Gallery that involved the artists bringing their drawing, painting and collage skills together to create visual dialogues that were a blend of the artists individual works |2| (read the 15 Bytes article here). Liberty Blake is the Lab’s current resident artist (see the article above), and it is due to her gracious embrace of the project that all the artists will be able to squat at The Lab during the festival. But she’s not content to simply be a host, and will be getting her hands dirty as well, and testing her patience with her colleagues. She’s asked Rossiter to help with a large-scale project they are calling 10 Riddles Wisely Expounded.|3| On 144 square feet of drywall that stretches across the Lab’s gallery walls, they will be working on a piece that incorporates collage, painting and drawing.|4| Blake will also be creating collages with works donated from the Francis Zimbeaux trust. And not to leave the audience out of the fun, she’ll allow visitors to play Aesthetic Roulette: rearrange a series of 9 collages in the correct orientation and you can take the collage of your choice home. Artists will be working at The Leonardo throughout the Festival. You can stop in the morning to check out the work and return later to see what progress has been made (or, if maybe the band has broken up over artistic differences). You can check out our CollaborART page for a full list of participating artists, and for specific times and events (we will be updating this page over the next two weeks).